The Nottingham Doubles is now established as the most popular doubles event and the biggest single day amateur squash tournament in the country regularly selling out and attracting 200 players . This is the 25th anniversary of the event and so we are trying to make it bigger and better than ever. Nottingham Squash Club are putting on some food deals throughout the day and some drink offers in the evening. Innes England have come in as title sponsor which for the first time has given us the opportunity to attract some top professionals into the A Grade with a prize fund. Weavers Wines and Eye Rackets are providing prizes for all the amateur grades. 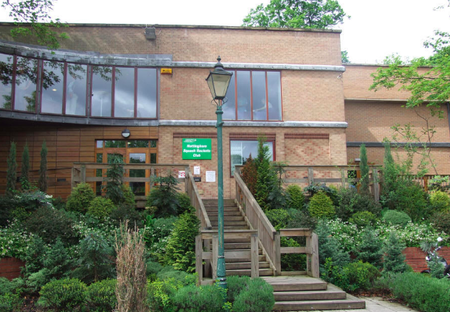 Nottingham Squash Rackets Club it is one of the best squash clubs in the UK. 10 courts including 6 glass backs, a gym where you can warm up and a cozy bar situated in the heart of the iconic Park Estate. All matches are best of three games, every competitor is guaranteed at least 3 matches on the day! If you are looking to enter the popular events such as the B, C or Mixed grades, please enter as soon as possible to avoid disappointment. T-Shirts: tournament shirts are £5.00 each and well worth the investment. Quick dry sports material and sublimated print. We will not have spares available on the day so make sure that if you would like a t-shirt you have signed up for it at the time of booking. Prizes: A Grade £1000. All other grades winners will receive a select bottle from Weavers Wines (this proved very, very popular last year) as well as Eye Rackets accessories. ​Throughout the day Nottingham Squash Club will be putting on food. 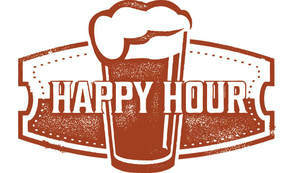 In the evening we will be running a "Happy Hour" during the finals with some great deals on drink. This year's A Grade should be the strongest yet making it well worth hanging around to watch and make the most of the bar! All grades will have group stages leading into a knockout. The top two teams from every grade will progress to the semi-finals. All competitors are guaranteed at least three matches! All matches will be best of three games PAR scoring to 11. Sudden death at 10-10. The popularity of this event has meant that there has sometimes been waiting periods between matches. This year we will aim to have all C, D and E grade group stage matches finish before lunch. This means that A and B grade matches will not begin until after lunch. All semi-final and final matches will then take place later in the afternoon. Serving: There will be a 1st and 2nd server. In the first point of a game the 2nd server will serve. Courts: The A Grade will play on a doubles sized court. All other grades will all play on standard sized squash courts. This includes the semi-finals and finals. Scoring: Scoring will be PAR (Point a rally) to 11. If the game reaches 10-10 then it is sudden death to 11. Matches will be best of 3 games. Strokes and Lets: Strokes will only be awarded if the ball hits a player or if someone is deliberately blocking and obstructing play. Two squash legends are set to make their return to Nottingham Squash Club for the 25th anniversary of the Innes England Nottingham Open doubles. Ex World no.2 Peter Marshall and ex World no.3 Simon Parke will form a legendary squash doubles pairing and take on the young professionals in the A Grade. With his unique double-handed playing style, Marshall finished runner-up to the great Pakistani player Jansher Khan at the World Open in 1994 and the British Open in 1995. When he reached the World No. 2 ranking behind Jansher in November 1994, many observers felt he seemed a strong candidate to displace the aging Pakistani champion as World No. 1. 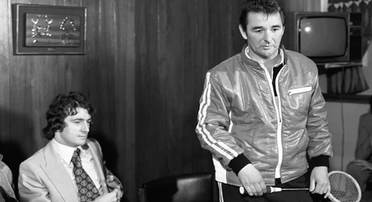 However, in 1995, Marshall was afflicted with glandular fever, the effects of which meant he was unable to play top-level squash for two years. 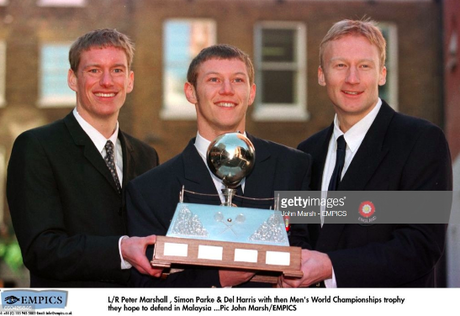 Marshall returned to the professional tour in 1997, re-claiming his place in the England squad which went on to win the World Team Squash Championship title in Malaysia. He broke back into the world's top-10 in 1999, and won his third British National Championship title in February 2000. He was protecting a remarkable record, having been unbeaten in that event since December 1989. Parke was part of the England team that won the 1995 Men’s World Team Squash Championships and 1997 Men’s World Team Squash Championships. He also won the US Open title in 1999 and won the British National Championships in 1998. Parke reached a career-high world ranking of World No. 3 (Oct 2000). The Nottingham Open Doubles is running at it's traditional home this year. Nottingham Squash Club. The Nottingham Open Doubles "takes over the club for the day". With 10 high quality squash courts including 6 glass backs and 2 doubles courts Nottingham Squash Club is the ideal venue to host the biggest doubles event of the year! The Nottingham Open Doubles is the largest doubles tournament in the country and runs in February every year. The event has been running since 1994 making this the 24th Nottingham Open Doubles! Last year that Nottingham Squash Club hosted the event every grade was packed with over 170 players taking part. Follow this link to view the report and results from last years event. 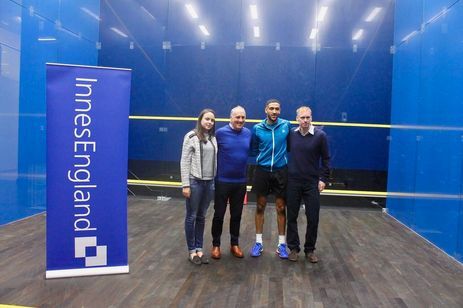 Innes England have been a long standing supporter of Nottingham Squash and Nottingham Squash Club. It is great to work with Innes England as they passionately care about the sport. ​Over the past few years they have sponsored the PSL team, The Nottingham University Graded and PSA. Weavers Wines are returning as a sponsor for the second year running. 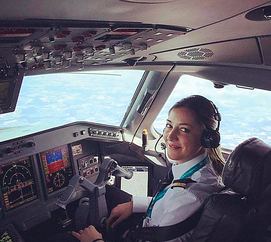 The 2018 winners greatly appreciated their Weavers Wines prizes with one winner heard to comment "this is going to to be of much more use than a racket..."
TRAIN FOR A CAREER AS AN AIRLINE PILOT ! Eye Rackets are back as a sponsor for this year's event. All competitors will receive a free wristband and grip. ​The Nottingham Squash Club shop stocks a full range of Eye Rackets that you are able to trial for free throughout the Nottingham Open Doubles. Tournament special offers will be available throughout the day, more information to follow! 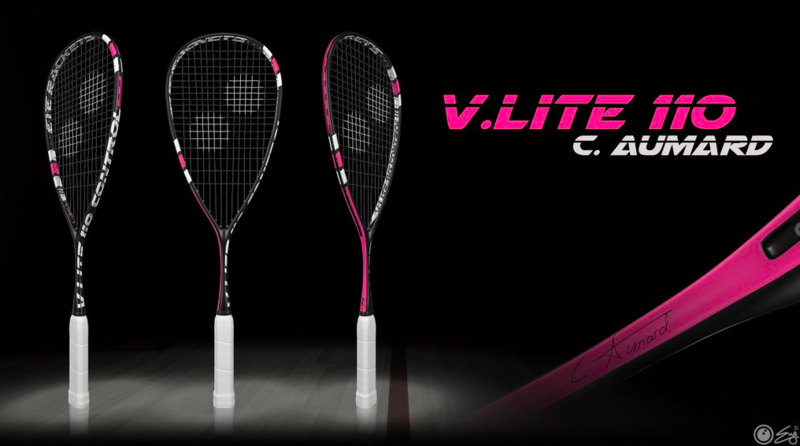 Our Nottingham University no.1 Coline Aumard has her own signature Eye Rackets range, she will no doubt be chopping up the boys in the A grade so have a watch and cheer her on! We have been passionate about supplying top-quality log cabins for many years. Whether you are looking for a garden shed, a log cabin that can be used as an office, a games room, another bedroom, or just a quiet retreat, The Log Cabin Store are dedicated to meeting your every need.